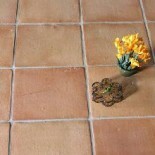 Terracotta Tiles The Green Solution. Terracotta has been with us for thousands of years. The term ‘Terracotta’ Is derived from the Latin; ‘Terra Cotta’, translated means ‘baked earth’ Early examples of terracotta back as far as 3000 BC and the most famous use of this environmentally friendly produced material is probably “The Terracotta Army” a fantastic collection of life size warriors and horses buried in the mausoleum of Qin Shi Huang, the first Emperor of China. The manufacturing process of our terracotta tiles is still carried out in the same environmental way as in the past thousands of years. We use the natural elements of earth, fire and water to produce a high quality terracotta tile that will withstand the test of time. Using Earth (lump clay) we mould the tile into the required size, unlike cheaper tiles ours are manufactured to be much more solid, whilst retaining a porous element but still reducing the many honeycomb air bubbles you will find in cheaper tiles, so weight for weight you will find our terracotta tiles to be heavier. Quality is paramount as we understand the importance of a good solid hard wearing tile that is going to give the best wear and tear without cracking or losing substance over time. Once we have the terracotta tile to the required shape, mould and consistency, we then use a firing process ensuring the terracotta tile is heated to give it strength. We only use by-products such as almond shells and olive pips in the firing process, as opposed to burning precious fossil fuels and resources. Our terracotta tiles are one of the greenest solutions available and at the same time producing something that is not only versatile, hard-wearing but will give many years of practical use and retain its beauty. This entry was posted on October 28, 2013 by Living Terracotta in General info.